Interactive synthesizer with unique analogue/digital crossover sound engine, 37 mini keys, on-board pattern sequencer and vocal FX that provides the best of both worlds: the warm, smooth response of classic analogue, and the clarity and versatility of modern digital. The newly developed monophonic analogue synth section features saw, triangle, and square waveforms with pulse-width modulation and an analogue filter, plus an independent sub oscillator for low-end power. Two digital synth sections offer a wide range of high-quality SuperNATURAL synth tones, including pads, strings, electric piano, sound effects, and many others. The sequencer offers four separate tracks – two digital synth parts, analogue synth, and drums – allowing user to build rich-sounding loops for any genre. Real-time and step recording modes are provided, along with a special TR-REC mode for programming in the style of Roland’s classic TR-series beatboxes. It is easy to play patterns and tweak sounds during the performance, and many preset patterns are built in for jamming right out of the box. Packed with a variety of dynamic drum kits, the synthesizer delivers quality rhythm tones to suit any groove. Included are many types of electronic and acoustic kits, and the drum instrument assignments are conveniently labelled above the keys for quick identification. The kits can be also personalized for any music by adjusting filter, envelope, pitch, and pan parameters on individual drum sounds. The instrument includes four simultaneous effects sections for enhancing any sound. Effect 1 and 2 provide selectable processing options such as Bit Crusher, Slicer, and Ring Mod, while dedicated Delay and Reverb sections make it easy to envelop sounds in spacious ambience. Each effects section can be turned on/off separately for the three synth sections and drums, allowing user to shape the mix with many creative combinations. The Axial sound library site further provides a growing selection of free new sounds and patterns for the synthesizer. Axial features sounds for many other Roland synths as well, all created by top engineers and leading electronic music artists. The synthesizer comes with a sturdy, high-quality gooseneck mic that brings even more fun to the party. Using the Vocoder, user can sing into the mic and control the tone and pitch via sounds played on the keyboard. With AutoPitch, it is simple to achieve the exaggerated, robotic vocal sounds that are common in today’s pop and electronic music styles. There is also an Auto Note function that allows user to “sing” JD-Xi synth sounds without touching the keyboard. Dimensions: 575 x 245 x 85 mm. Weight: 2.2 kg. 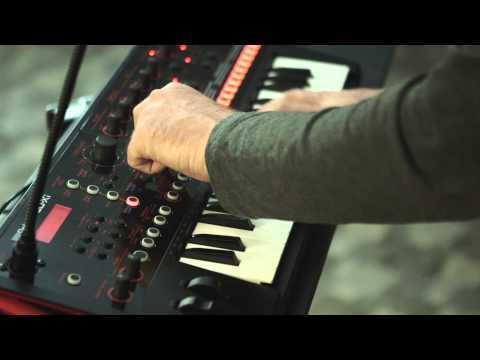 Do you own Roland JD-Xi or have you had a chance to try it?